The Cognitive Behavior Therapist | New York City Cognitive Behavior Therapist providing Psychotherapy and Health Psychology Services – CBT, EMDR, Biofeedback Therapy, Yoga & Couples Counseling In New York City. 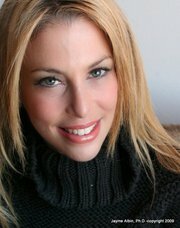 Dr Albin is a licensed Clinical Psychologist and Certified Yoga instructor. -Midtown New York, NY 10022 Jayme Albin, Ph.D is a psychologist and psychotherapist who specializes in managing personal and professional relationships and goals. Treatment areas of specialties include of anxiety,phobias, OCD, panic, social anxiety,Adult ADHD, depression & mood disorders; body & self image problems, and impulsive behaviors & thought disorders. I truly enjoyed Dr. Albin’s workshop on Sunday. Not knowing what biofeed back was, I had no idea what would take place in this session. Through machinery and Dr. Albin’s knowledge, I learned about my bodies reaction to thoughts and now know this is a ‘must’ if I want to feel well and sleep well. Dr. Albin’s explanation of ‘how things work’ inside of us was descriptive and comprehensible. The other people in the workshop were interesting and added to the over all good experience I had. ARE THERE SOME NEW CHANGES IN CBT WHICH HAVE COME OUT? ARE THERE SOME NEW WAYS WHICH ARE BEING USED TO CURE OCD.